Relate: “The rich and powerful take what they want. We steal it back for you.” Nathan Ford said that line during the opening credits of every single episode of Leverage. I loved that show for that very reason. Of course, there was an overarching plot but as it moved along, every week somebody would hire this team of thieves to play Robin Hood. They would find some poor soul who would have no other way to get justice, and rob the individual or corporation that exploited them. Continuum plays on the same social divide. In some dystopic future, corporations have taken over the world. (They haven’t already?) A group of terrorists (or freedom fighters) travel through time to our present day that they might stop those corporations before they become all powerful. The supposed good guy comes back to stop them but as the show moves forward she begins to wonder if she really wants to defend and fight for the future she left. Those who are rich should boast that God has humbled them. They will fade away like a little flower in the field. The hot sun rises and the grass withers; the little flower droops and falls, and its beauty fades away. In the same way, the rich will fade away with all of their achievements. Look here, you rich people: Weep and groan with anguish because of all the terrible troubles ahead of you. Your wealth is rotting away, and your fine clothes are moth-eaten rags. Your gold and silver are corroded. The very wealth you were counting on will eat away your flesh like fire. This corroded treasure you have hoarded will testify against you on the day of judgment… You have spent your years on earth in luxury, satisfying your every desire. You have fattened yourselves for the day of slaughter. As fun as it is to read such things, it is honestly hard for me to remember that God loves rich people too. As fun as it might be to poke fun of Don Trump when he stands in front of a camera and yaps away like an idiot, he needs Jesus too. The love that Jesus showed to the poor, the hurting, and the oppressed He also poured out on Zacchaeus. 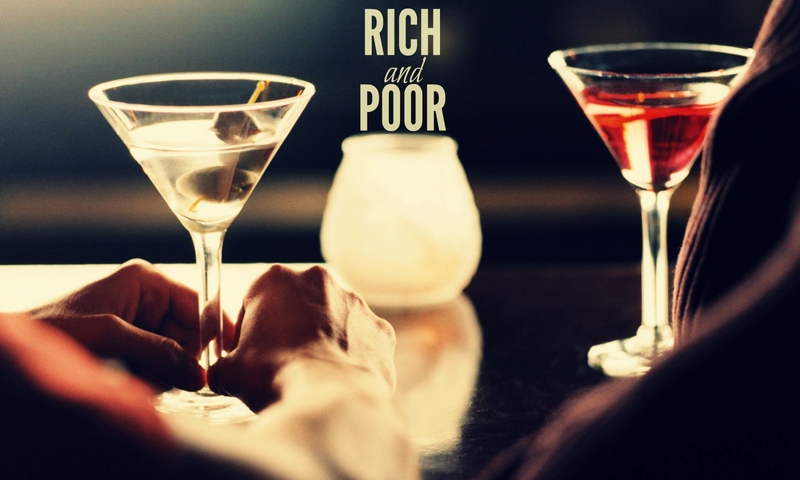 The rich and the poor have this in common. He made them both. He loves them both. He died for them both. And I need to be interceding for them both. God, help me to never forget that spiritually we are all poor and powerless. None of us can save ourselves. Whether fiscally rich or poor, we are all in desperate need of You. Nothing we could do will ever make You love us more. But also nothing we could do will ever cause You to love us less. Your grace is all any of us could ask for and more than any of us deserve. I ask that You would shower Your grace on us and draw us, rich and poor alike, to You. ← August 25 – Friend or Foe? lest I be full, and deny thee, and say, “Who is the Lord?” or lest I be poor, and steal, and profane the name of my God. It’s really not bad to be rich for He became poor that we might be rich but when we trust in the riches, we are basically finished. Awesome and great post though. God loves us all. I remember living for a couple months at a state park while we were between homes. If we allow it…God will teach us…cultivate…till in us…great things. Great Post Beejai!!! It’s an excellent post!